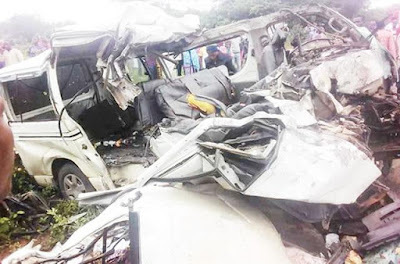 Nine people have been confirmed dead, while one other was injured after a Toyota Hummer crashed into a truck in Awo community, in the Irepodun/Ifelodun area of Ekiti State. It was learnt that officials of the Federal Road Safety Corps and policemen from the Ekiti State command responded to the incident, as sympathisers assisted in bringing out the mangled remains of the victims from the vehicle. It was learnt that the only survivor was the bus driver. The vehicle was coming from Lagos and heading to Abuja when the accident occurred around 6am on Igede-Awo Road. An official of the FRSC, who spoke to The Punch on the phone, said the driver was on top speed when he rammed into the trailer. He said, “It was an 18-seater bus and it collided with the trailer on Igede-Awo Road. The accident happened around 6.15am. A total of 11 people were involved. Nine people died and their corpses have been deposited at the mortuary of the Federal Teaching Hospital, Ido Ekiti. The two people who got injured were admitted to the medical centre. The vehicle was not fully loaded. The state Police Public Relations Officer, DSP Caleb Ikechukwu, said the bus had the number plate, Lagos EKY 978 XJ, while the trailer was registered, Yobe XB 404 FKA. He said the police had started making efforts to inform the family members of the victims. The spokesperson for the FRSC, Bisi Kazeem, said the accident was caused by speeding.